Make your sisig better than your bros'! Maybe our #PinoyPride's making us a bit biased here, but we firmly believe that a drinking session with the boys wouldn’t be complete without a plate of sizzling sisig on the table. It’s the perfect thing to line your stomach with in preparation for all the alcohol you’ll be ingesting throughout the night, and every Filipino worth his salt should know how to cook this pulutan staple. "When cooking sisig, the best part to use is the [pig's] face," says Chef Nico Cruz, the man behind Greenfield Weekend Market burger joint The Chef Next Door. "Boil it with salt, pepper, and bay leaves, then grill it together with some pork liver. Chop it into small pieces and season with mayonnaise mixed with vinegar, salt, and pepper. Mix it with chopped white onions and finger chili." Serve it piping hot, add a raw egg, and voila!, you’ve got yourself a culinary masterpiece! Now that you know the basics, mix it up by using different ingredients and cooking styles. Don’t be afraid to mess up a little—you’re already cooking a pig’s face, so anything else you do will most likely be tamer in comparison. 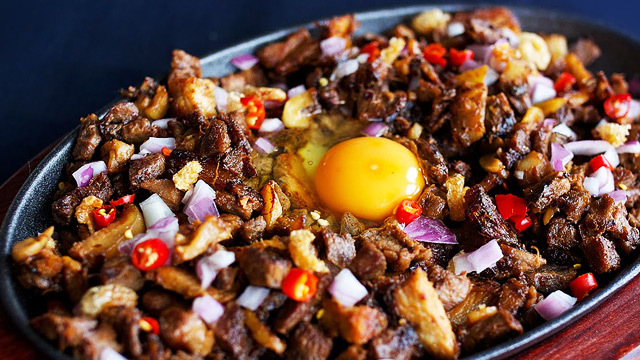 Keep reading to see how you can make your sisig something to cheer "hooray" about. If you’re not squeamish, you can go the traditional route by using pig brains instead of mayonnaise as the dish's binder. After boiling and chopping the other porky parts, sauté them alongside some pig brains and the other regular sisig spices like chili, onions, pepper, and vinegar. We promise, once you take a bite, you'll know that it's worth the slight tweaking! Can’t be bothered to eat your sisig from a plate? Then the sisig burrito’s the dish for you. Heat up some flour tortillas, cover 2/3 of them with a thin layer of rice and sisig, then roll it up as you would a traditional burrito. You can even add a fried egg before wrapping it up for a more authentic dining experience! Not feeling Mexican? Chef Cruz recommends adding some gochujang, or Korean chili paste, to the mayo. "That'll give a different taste to the final product," says Cruz. "Sprinkle your sisig with sesame seeds, and eat it by rolling the meat in lettuce leaves, like samgyeopsal." Sisig is usually boiled then sautéed, but deep-frying is also a very good (but very sinful) option. Boil your pig parts with some calamansi juice, pepper, salt, crushed garlic, and a teaspoon of baking soda for 45 minutes to an hour in medium heat so they’ll have some flavor. Drain the meat, and when it’s completely dry (paper towels can help in the drying process), deep-fry it, making sure everything is covered by oil. After frying your meat, proceed like you would ordinarily make sisig. Throw in some cilantro or parsley to give your usual sisig a kick of freshness, suggests Chef Cruz. "Add cilantro, a squeeze of lime, and a swig of Tabasco, solid na yan!" 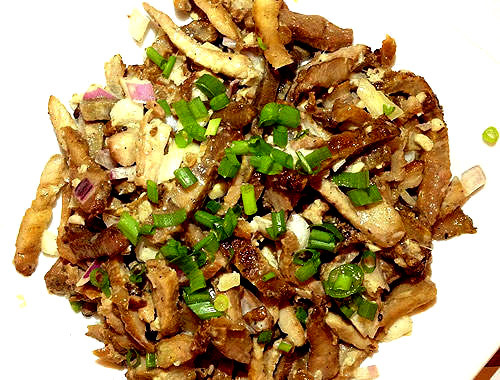 You don’t need us to tell you that sisig is one of the most fattening Pinoy dishes ever. Make it a bit more heart-friendly by substituting healthier options, like tofu, bangus, lean chicken meat—heck, even mushrooms—for the usual pork parts. Deep fry them until crispy, chop it into bits, and serve it with the usual sisig ingredients. Okay, it’s still not that healthy, but it’s definitely better for your heart, right? Want to know more about other kinds of sisig dishes? Visit our sister site Yummy.ph!